Mirissa Colson has been raised, from the time she was seven, by her father. She has always thought that her mother abandoned them both. But when she reaches eighteen, she learns the real truth, her family’s secret, and that secret reveals an entire world that she never knew existed. She learns about the Greek gods, demi-gods, and preternatural beings, both good and evil. And she learns that she has extraordinary powers meant to help her fulfill a prophecy, that she must save the world. 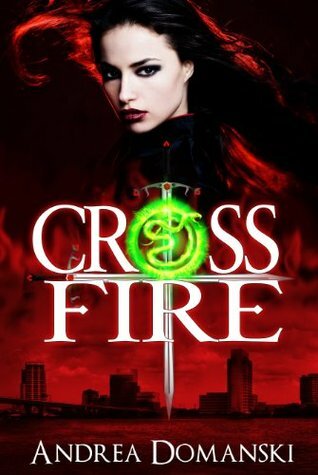 Crossfire is a thriller, with non-stop action. Mirissa is kidnapped and has to escape. Then she undergoes training and there are mock battles. And there are enough real battles to fill several lifetimes. Each battle is described in complete detail, blow by blow, and I have to admit, I grew tired of all the very detailed descriptions. I know nothing about martial arts, so the dynamics of the fights didn’t really draw me in. I would have liked to have seen more character development, and more details about the relationships Mirissa forms. Nevertheless, the plot is well-crafted and I was on the edge of my seat throughout the entire novel, reading it in one sitting. It is a coming of age story and a dramatic one at that. Mirissa has to absorb a great deal of information in a short amount of time and she ends up having to figure a lot of things out for herself, in the heat of battle. She is fighting not only for her own life, but for the lives of her father and friends as well, and the tension builds all the way through the novel to a heart-stopping conclusion. I also liked the mythological aspect of this story and I felt that the history of the ancient world was well-researched. Discovering how Artemis and other deities have lived over the years until the present was fun. Discovering how the ancient gods are still operating in our world was intriguing. Fantasy readers are sure to enjoy this exciting story, and I look forward to the next in this thrilling series.